Teatro Olimpico The Accademia Olimpica, established in 1555, with those cultural functions which were common to all the academies founded in Italy during the sixteenth century decided to commission a theatre for staging classical plays. 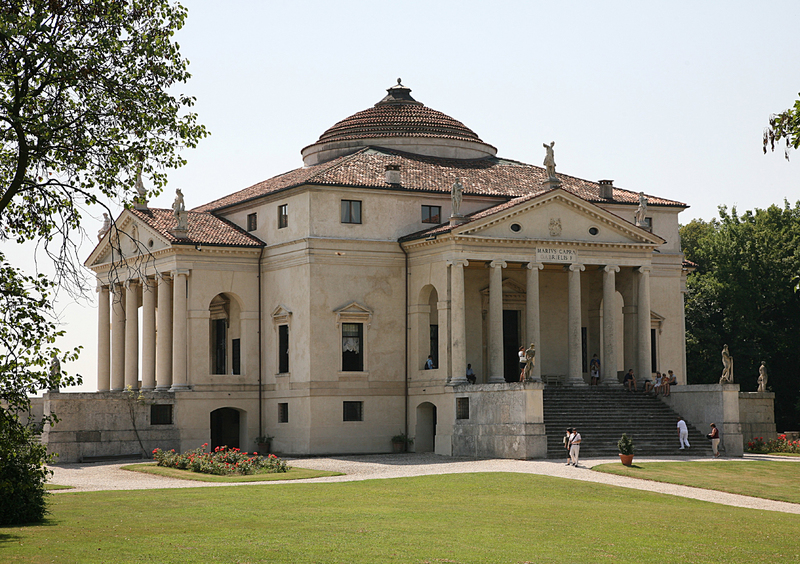 The design proposed by Palladio was accepted and work started just a few months before his death. It was completed by his successor Vincenzo Scamozzi. 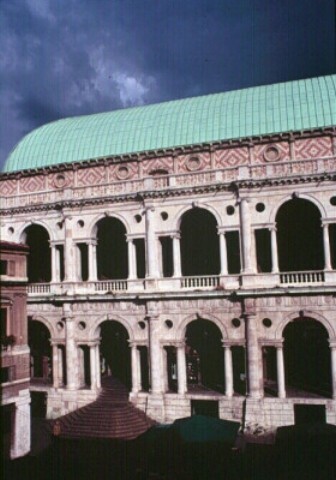 Like a Greek theatre, Palladio's last and original work consists of a cavea (seating space), a proscenium and fixed architectural scenery which represents the three streets of the ancient city of Thebes, even though the three architectonic perspectives bear a greater resemblance to Renaissance streets, or indeed the streets of Vicenza indeed, than to those of a Greek polis. 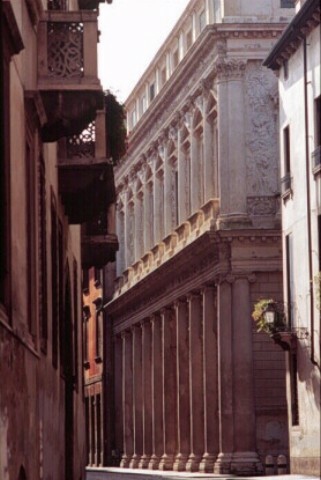 Capitaniato Situated in Piazza dei Signori, facing the Basilica, it was designed by Palladio as the official residence of the Capitanio (a military authority instituted by the Venetian government) in 1571 as witnessed by the inscription on the right-hand architrave. 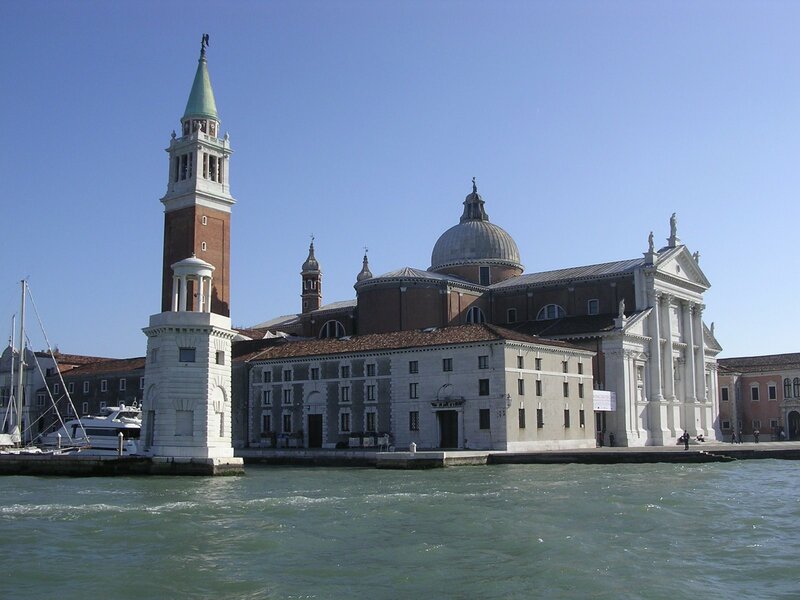 The white stucco work and the stone statues which decorate the building commemorate the Venetian victory over the Turks at the battle of Lepanto (7 October 1571) and provide a contrast to the red brick surface of the wall facing. 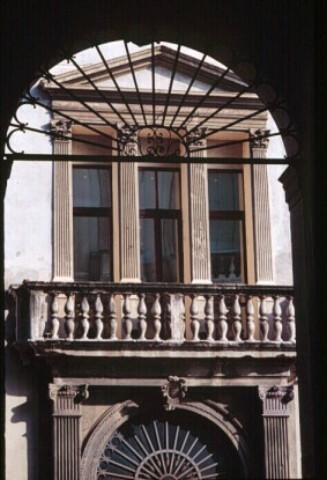 The three imposing arches of the portico are highlighted by the demicolumns of the gigantic order which soar up to the balustrade of the attic, in a style which is characteristic of the later works of the great Veneto architect. Palazzo Barbaran This palace designed by Palladio for Count Montano Barbarano in 1569-70 has been restored to its original splendour by its recent restoration. The foreground is decorated by Ionic demicolumns with the plane behind enlivened by the sequence of Corinthian columns and by magnificent reliefs. Reliefs and stuccoes also enrich the rooms inside to which access is gained through a grandiose atrium with Doric columns. 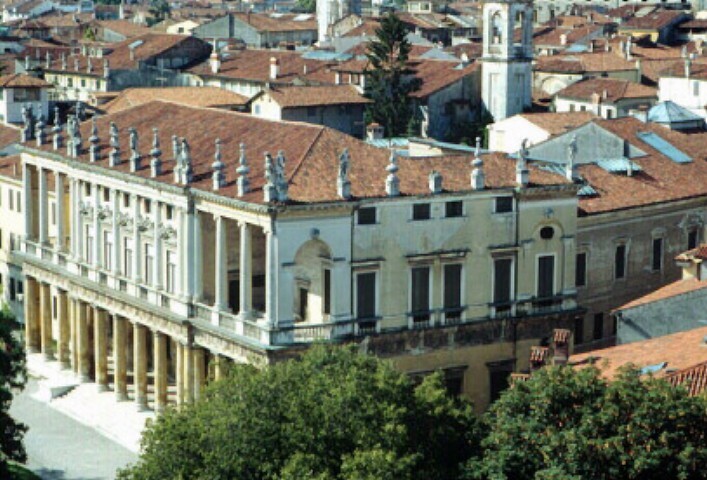 The building is the seat of the Monuments and Fine Arts Office and of the Centro Internazionale di Studi di Architettura dedicated to Palladio. 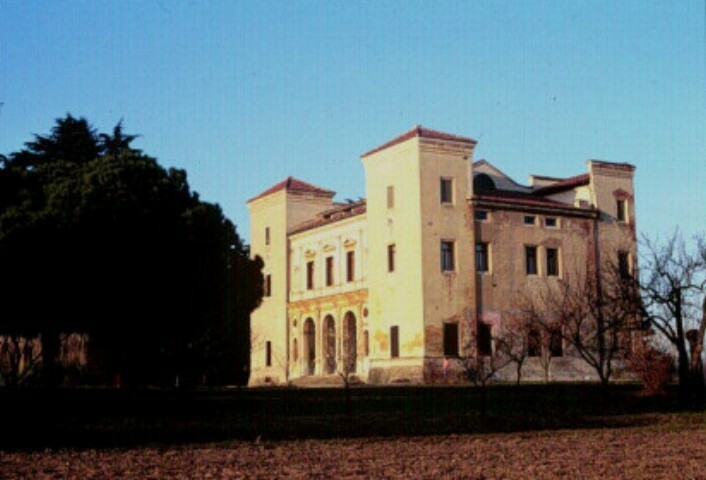 Palazzo Pojana Palladio's original design, now conserved in London's Burlington Collection, was not fully respected when the palace was built in 1561-1566. 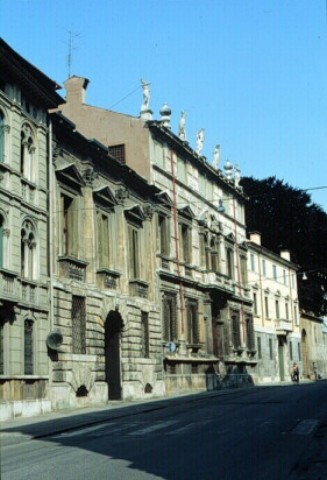 This palazzo, incorporating two pre-existing buildings, straddles the road which passed through Vicenza's Jewish ghetto. The ground floor, with its robust ashlar work, supports the piano nobile where the large windows, surmounted by tympanums alternating with archivolts, are staggered with giant Corinthian pilasters, creating a delicate chiaroscuro interplay on the light plaster surface. Civena Trissino One of Palladio's early works, this building shows the influence of Renaissance architecture in Rome. Begun in 1540, as a medal commemorating the start of the work testifies, it was completed about two years later. 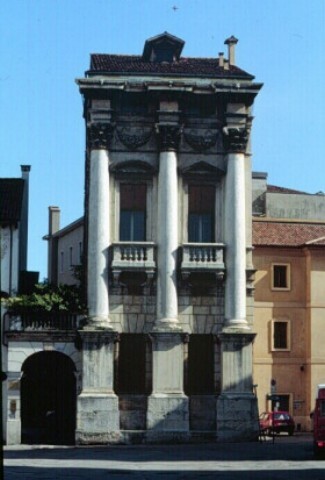 The piano nobile, consisting of five windows divided by double Corinthian pilasters, rests on an elegant portico in which the contrast between the arches and the light ashlar work is mediated by round and rectangular niches cut into the pilasters. Palazzo Thiene The origin or this architectural design is controversial and has been attributed to both Palladio and to Giulio Romano though it is included in Palladio's famous treatise "I quattro Libri dell'Architettura". In any case, the work is dated 1542-54, and its "Roman" character is highlighted by the insistent use of rustication, both on the ground floor and in the borders of the first floor windows. Iseppo da Porto This is an early work of Palladio's, and the plans, along with others, are now in the Burlington collection in London. 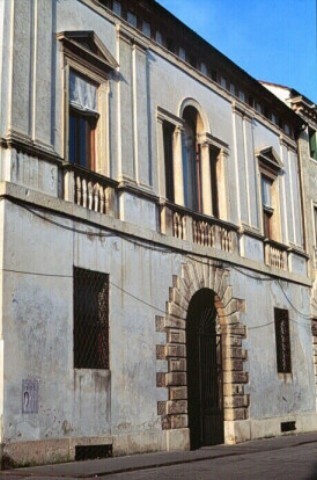 The elegant structure is divided into three floors: the ground floor wall, in which six windows surmounted by masks open, is faced with light rusticated ashlar work, almost as if to represent the strength necessary to support the elegant piano nobile, in which the succession of windows with balconies, and decorated by tympanums and reliefs, is broken by Ionic columns. A high frieze separates the third part of the facade: a windowed attic enlivened by short pilasters and statues. 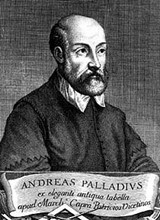 Palladiana On 11 April 1549, the Council of One Hundred, responsible for the Gothic "Palazzo della Ragione" decided to commission Palladio to do this job. Palladio's plan - on which he worked all his life and which was only completed in 1614, after his death - envisaged that the earlier building be enclosed on three sides (the east being occupied by a pre-existing structure) within a grandiose double order of loggias, organized in the style of Serliana or Venetian windows (now also known as Palladian windows). The enormous interior space, a single hall, is covered by a keel-shaped roof which gives the basilica its characteristic appearance, recognisable above the city's skyline, even from a distance. Bonin Longare The structure of the palace is based on the characteristic stylistic elements of Palladian buildings, even if it was finally completed by the architect Vincenzo Scamozzi, during the early years of the seventeenth century. The double order of Corinthian columns which ornate the two floors of the facade also repeats the sequence on the rear which faces the wide courtyard and park. Inside, the palace is decorated with fine eighteenth century frescos. Breganze Palladio was probably the author of the design for this palazzo, begun - but not concluded - by Vincenzo Scamozzi, towards the end of the Cinquecento. 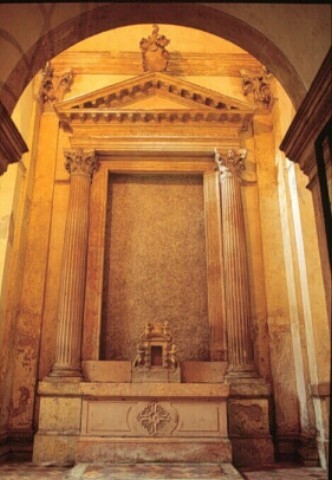 The only three demicolumns remaining were to have been completed by another five and it is possible to imagine how the palace would have been if it had been finished: there would have been a lightening of the weight upwards, starting from the high base and from the rustication from the first floor upwards, to the balconies of the piano nobile and the elegant Corinthian capitals connected by festoons rich in classical motifs. Palazzo Chiericati This palazzo, one of Palladio's most original and interesting, was begun in 1550 but work on it continued for a whole century after the architect's death, until towards the end of 1680. 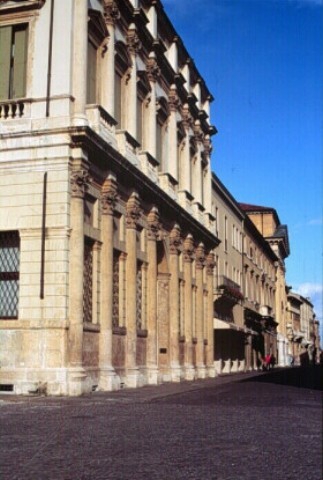 The facade of the building is composed of a portico on the ground floor and a piano nobile, the latter consisting of a central block - in which five windows open - and two galleries to the sides. The structure creates a powerful play of chiaroscuro effects and gives a sense of movement to the whole building, accentuating its lightness. 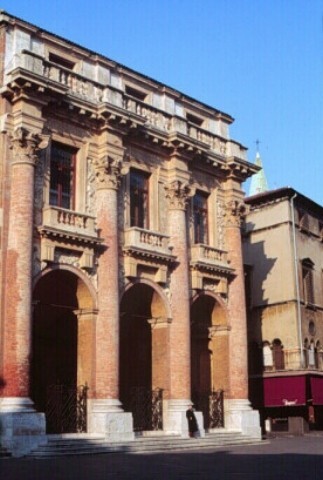 Palazzo Chiericati has been the seat of the Pinacoteca Civica since 1855 and conserves various works of great artistic interest in its rich collection. Scalette The monumental conclusion of the flight of steps which leads to the sanctuary of Monte Berico was erected in 1595 as shown by an inscription on the front. 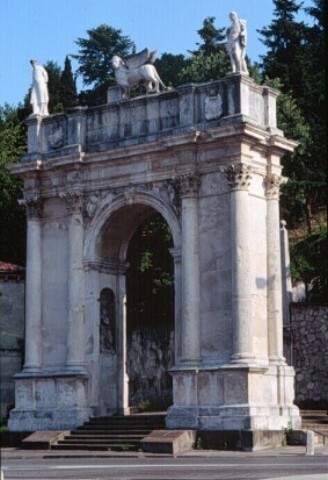 The model draws on the constructional scheme of ancient Roman triumphal arches, with a high arch flanked by Corinthian columns, terminated by an attic topped by statues by G. B. Albanese: a scheme which recalls the paternity of Palladio, as testified by one in the drawings of Lord Burlington's collection in London. Two niches, inside the piers of the arch, house statues of the Announcing Angel and the Virgin Annunciate respectively, the work of the sculptor, Orazio Marinali. Palazzo da Monte The entrance portal, underlined by rusticated ashlars which brusquely interrupt the smooth surface of the wall is contrasted on the piano nobile by an elegant "serliana" - the typical window much used by and named after the architect, Sebastiano Serlio - consisting of an arch flanked by short architraves. 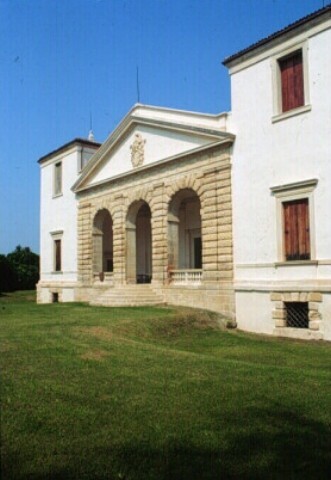 The building was very probably planned by the young Palladio, though it was carried out by others in 1581, after the architect's death, as an inscription on the string-course shows. Palazzo Angaran The building was probably commissioned from Palladio around 1560 by Bernardo da Schio and comprises a robust base on which the rustication acts as an ornamental element, highlighting the portal and the little arched cellar windows with large ashlars arranged in rays. 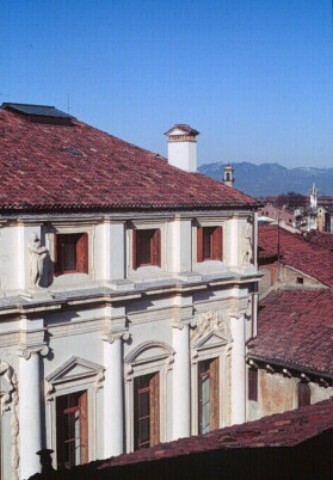 On the piano nobile there are three windows topped by tympanums and separated by Corinthian demicolumns, in a style which later becomes characteristic of Palladio, though with many variations and inventions. 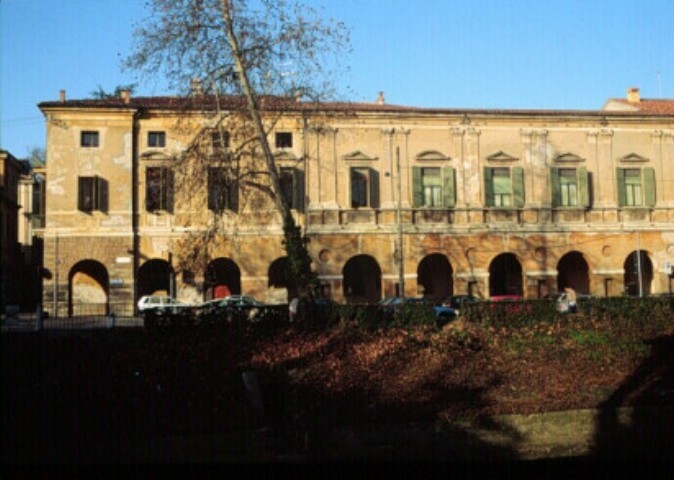 The rear of the palazzo looks out over an original garden on the bank of the River Bacchiglione. Casa Cogollo As several documents show, this house was built between 1560 and 1570 and it is apocryphal that Palladio himself lived here. There is no doubt, however, that he designed this small building, the home of a notary, endowing it with all the elegance of the large and much more important houses he built for Venetian patricians. On the ground floor, the facade opens with a serliana framed by two Ionic columns. 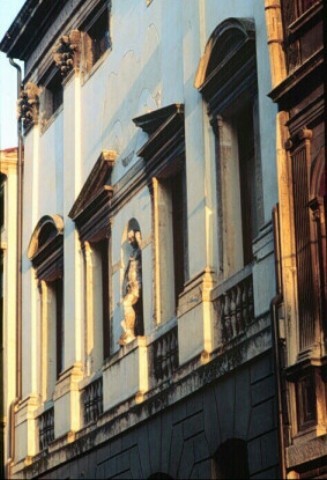 The two windows and the two grooved pilasters on the piano nobile provide a frame for a section of wall which, along with the second floor attic, was decorated with frescos, now lost, by Giovanni Antonio Fasolo. S.Maria Nuova This little church, probably designed by Palladio around 1578, was built after his death, between 1585 and 1589. Curved and straight motifs alternate along the whole facade: the four demicolumns which support the tympanum, the curvature of the great arch, the side niches and the oculus in the tympanum. In the interior, the single rectangular nave is crowned by Corinthian columns similar to those of the facade. Loggia Valmarana This elegant feature of the Giardino Salvi consists of five arches, which sink their piers into the waters of the Seriola, and six classical Tuscan columns surmounted by a tympanum. It was probably built at the end of the Cinquecento commissioned by Leonardo Valmarana - the humanist and expert in Palladian architecture - whose name is inscribed in the architrave and who, indeed, may have designed this little building which lives in symbiosis with the water bank, sharing its vibrations and atmosphere. Palazzo Garzadori A stylistic analysis of this original and elegant building makes the attribution to Andrea Palladio quite plausible, those it was built by one of his followers. The piano nobile, which rises above two large ground floor portals, has a chiaroscuro effect produced by four pilasters and the openings of four windows, two of which, in the centre, frame a niche housing the statue of Gerolamo Garzadori who commissioned the palazzo. Above these, a tympanum opened to hold the imposing noble coat of arms, removed during the nineteenth century. Duomo The cathedral, dedicated to Santa Maria Maggiore, though essentially Gothic, is however the result of work from different periods. 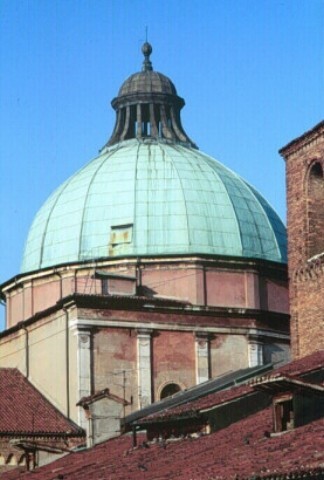 One of the most significant was the covering of the tribune, carried out under Palladio's direction in 1565, and the construction of the dome in 1574. 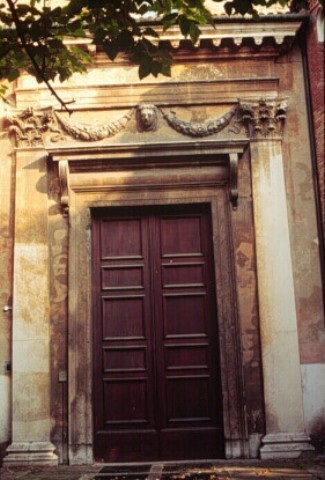 The door on the south side of the church - flanked by two Corinthian pillars which support an architrave decorated with festoons - is also from this period; some believe this to be the work of Palladio and, in any case, the man who commissioned it, Canon Paolo Almerico, was the same who commissioned Palladio's Villa Capra, known as the "Rotonda". Palazzo Capra This is the remaining part of a palace from the first half of the sixteenth century and is considered by some scholars to be an early work of Palladio's, subsequently incorporated into Palazzo Piovini-Beltrame, designed in the seventeenth century by the architect Antonio Pizzocaro. 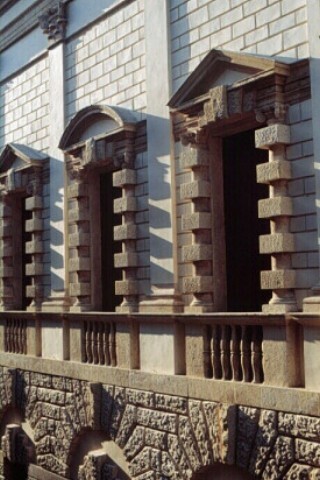 The motif of the two grooved pilasters which flank the portal on the ground floor is repeated and doubled in the definition of the three-mullioned window on the piano nobile, supporting the classical tympanum which tops the structure. Villa Trissino This is the house which the man of letters and humanist Giangiorgio Trissino had built, between 1531 and 1538, restructuring a pre-existing Gothic structure, immersed in a large park in the locality of Cricoli in the outskirts of Vicenza. He gave the structure classical rhythms, adding an arched portico on the ground floor and, on the piano nobile, windows with tympanums which lighten the severe mass of the corner towers. It was probably at this time, during the work, that the nobleman from Vicenza met the young stonemason, Andrea della Gondola, to whom he gave the lofty name of "Palladio", introducing him into the world of art and ancient culture and setting him off on his fulgent architectural career. 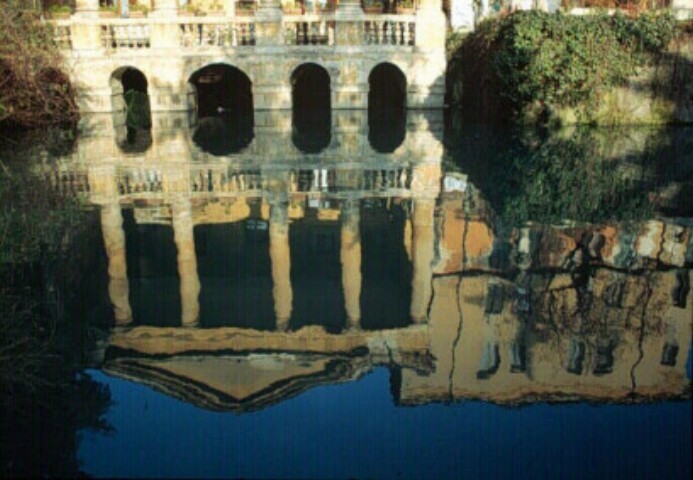 Villa Marcello The corpus of Palladio's drawings, now conserved in the Burlington collection in London, includes a project quite similar to this villa, located at Bertesina in the immediate vicinity of Vicenza. The unity of the facade is given by the eight Ionic pilasters which rise from a high base and which link the triple-arched portico to the short side wings which flank it. A tympanum surmounts the portico, inaugurating a usage which will become canonical in Palladian architecture over the coming years. Cappella Valmarana This evocative patrician chapel is situated beside the crypt, below the presbytery in the church of Santa Corona, one of the most significant examples of Romanesque-Gothic Dominican architecture in the Vicenza area. 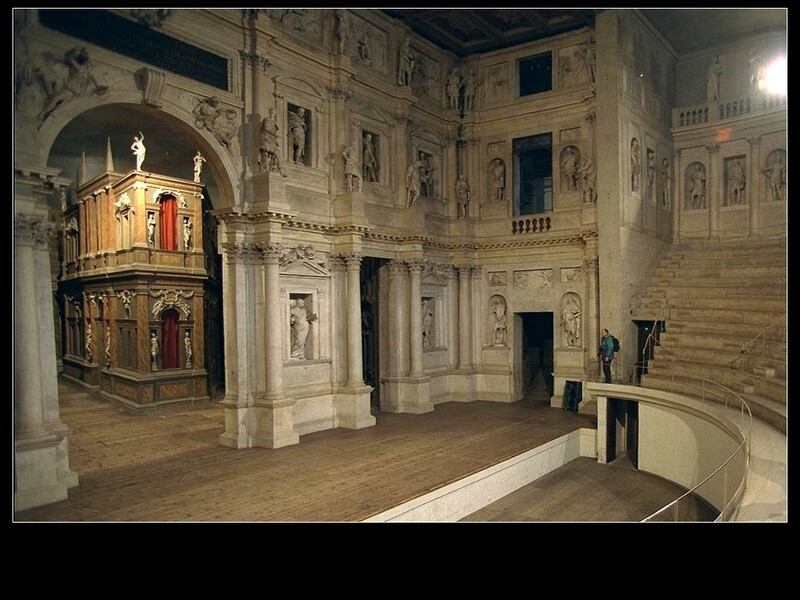 It was designed by Palladio in 1576 for the nobleman, Antonio Valmarana, who wished to be entombed there. 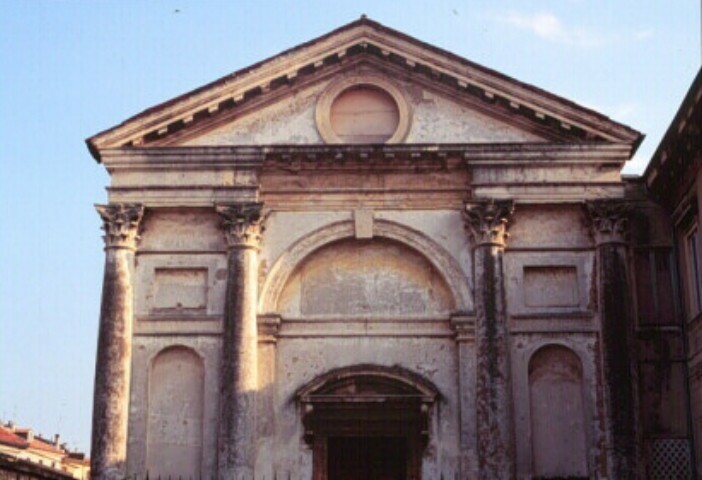 It was not until 1597 that Leonardo Valmarana decided to have it built, respecting the original plan, however, with its two lateral apses, linked by a fine vault, providing wings for the simple altar defined by two grooved columns bearing a tympanum and two pilasters. Villa Pisani The house which the Pisani brothers commissioned form Palladio, around 1544, for the centre of their land at Bagnolo di Lonigo, along a stream, represents, in all its compositional elements, the type of villa which the noble landowners of Vicenza and Venice were having built in the thirty years from 1530 to 1560. Here, a short curved flight of steps gives access to a central nucleus, consisting of a three-arched portico, with robust rusticated ribbing and topped by a simple tympanum. This is flanked by two lateral bodies with smooth walls in which two simple rectangular windows open, one on the first and one on the second floor.